Azure is a condominium villa in the seaside, resort-like village of Porto Cupecoy where shopping, restaurants, sports activities, and water access are right there and waiting for you when you step out of the door. They even have an on-site grocery store, a huge convenience for meal prep. This is a roomy single-bedroom apartment, perfect for any couple. It also comes with a kitchen, living room, and a spacious balcony that features an outdoor dining area and views of the community’s pool, landscape, and various buildings. It only takes a few minutes to walk to the gorgeous Cupecoy Beach or drive to any nearby, off-campus sites and venues. 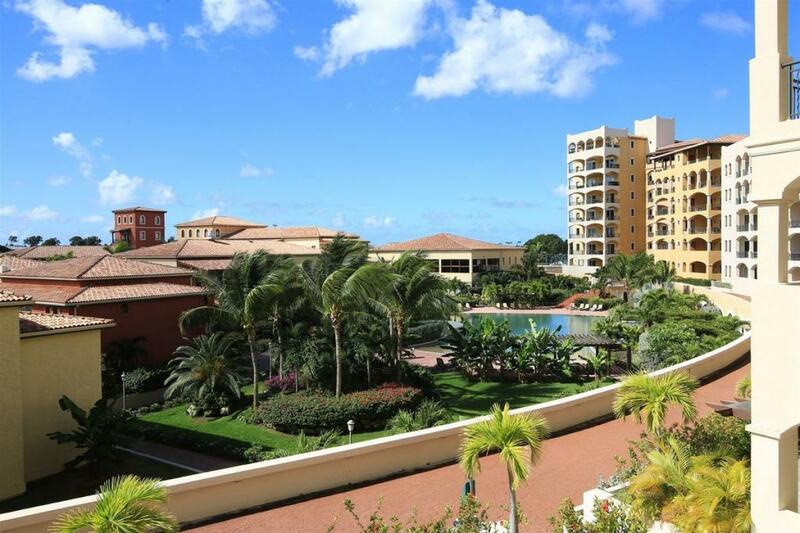 Aazure villa is an elegant and modern one-bedroom apartment in Porto Cupecoy, St Maarten. Cool colors of white and tan dominate the apartment, giving it an airy, and fresh feeling. Pleasing ocean and island-inspired canvas photographs decorate the walls while white leather couches and chairs maintain its modern and chic appeal. The apartment is fully air-conditioned, has WIFI throughout, and has Direct TV. It features an open layout from the kitchen to the dining and living areas. An outside terrace provides additional living and dining space as well as the perfect place to watch the sunset in privacy. The bedroom includes a four-poster, king-size bed with lightly falling white drapes and an en-suite bathroom. The owners took extra care to purchase a very comfortable mattress so their guests would always have a good night’s sleep. The bathroom has double-sinks, marble countertops, and a private tub. Porto Cupecoy is a Mediterranean-style village located on the Dutch side of St. Maarten, only ten minutes from Princess Juliana airport, a five-minute drive to casinos and the nightlife of St. Maarten, and only a five-minute walk to Cupecoy Beach. Porto Cupecoy includes a resort pool, tennis courts, fitness gym, on-site restaurants, shopping, a grocery store, and secure parking. Housekeeping service is provided every day except Sundays and holidays. (For religious reasons, some housekeeping staff take Saturday rather than Sunday as their day off.) This service is for hotel-type general cleaning and tidying only; towels will be changed daily and bed linens will be changed every 2 or 3 days. Guests’ personal laundry is not included in housekeeping duties, however guests may approach the housekeeper directly to make arrangements for their laundry to be done. The housekeeper will expect a suggested tip of $10.00 per load for this additional service. Cupecoy Beach, a popular beach on the island, is situated directly across the street from Porto Cupecoy. Upon arrival guests will secure a rental vehicle and drive to the property managers office in Cupecot.